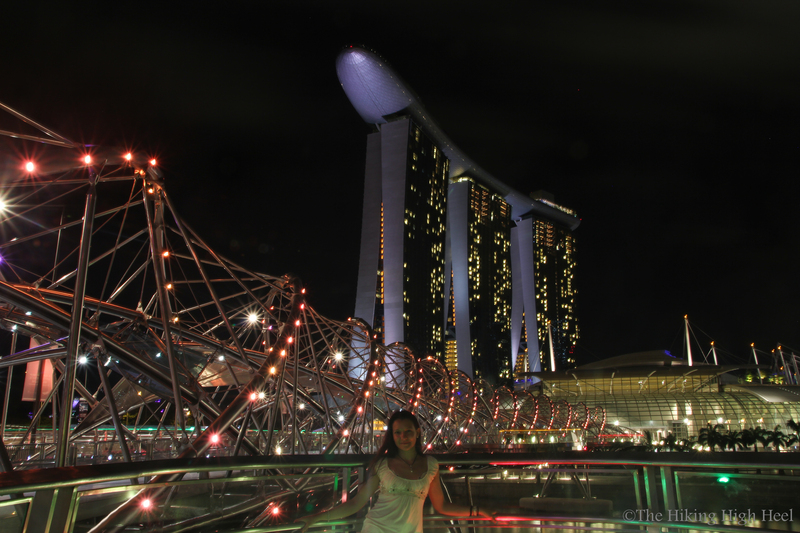 I have already been to Singapore three times. So for my part, I can say that I have spent about six weeks there all together. #1 My first recommendation is to buy some liquor at the duty free shop at the airport. 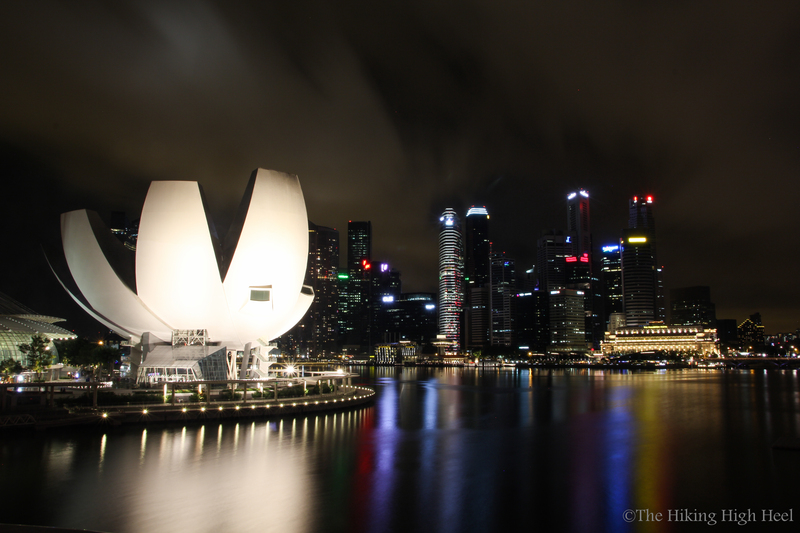 I have the impression that liquor is very expensive in Singapore, if you buy it at a normal shop or at a pub. Even beer. And at an average temperature of about 27-28 degree Celsius (even in the night) you do need a lot of cool beer. #2: As you walk out from the airport, there are two things you will notice immediately: the warmth and the organization how to take a taxi. First, you are thankful for the warmth. Five minutes later you will be probably thankful for the beer you’ve bought. If you have bought any. 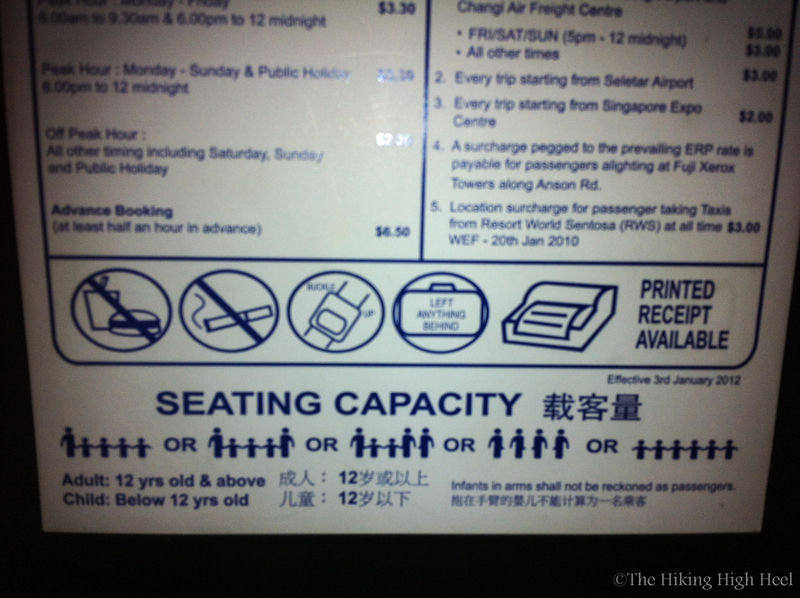 Who is driving (seating capacity example with 6 kids)? In Singapore there is no need to stop/fight for a taxi using your body, physical strength or make signs or sounds (like in other countries I’ve visited…). Everywhere there is a so called taxi queue, where everybody waits patiently for his turn to come. Often there is somebody in charge, who waves at you to show you the next free taxi, and this person also takes care that nobody jumps the queue. Besides the fact that there is no need to call a taxi on your own, it’s also a good method to improve the employment quote, I think. I know this from Bulgaria, where there is a person, who takes your parking ticket and puts it into the parking machine for you. Although the machine is standing right next to your car window and you just need to reach out. To take a taxi is cheaper than in Germany, but after all, it’s cheaper to take the MRT or the bus. 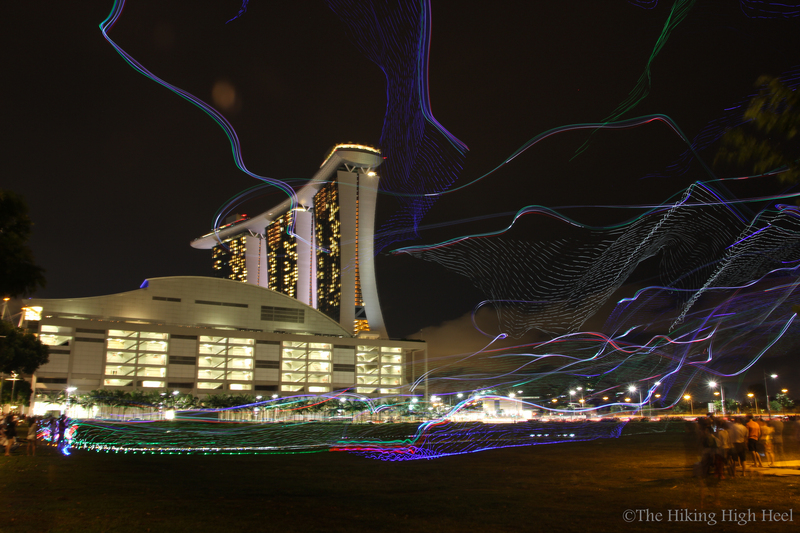 These means of transport, especially the MRT, are not affected by traffic jams. For the MRT you need a EZ-Link pass, which is a plastic rechargeable card. You can purchase the card at every MRT station. The MRT is very well organized and I like the names of the stations and the announcements during the ride. My favorites in Singapore are: „Tut, tut, tut, tut, doors are closing…“ or „Please, mind the platform gap!“ or „Next station: Lavender“. As you can see, I spent a lot of time at the MRT and can tell you a thing or two about it. When using the escalators at a MRT station, always stay on the right side, except you want to go up-/downstairs faster. Then use the free left side (or was it the other way round???). Some of the Singaporeans might get angry or annoyed, if you don’t respect this rule. Taking the bus could be a little bit confusing because they don’t announce the next station. So you have to check carefully, where to get off. And don’t forget to tap out (EZ-link pass), otherwise you will be charged with the whole bus trip, including all stations on the bus route. #3: When crossing the street, look first to the RIGHT!!! I cannot reprogram my brain so quickly, so I always look in both directions: left AND right. For those of us, who can read, it’s often written on the asphalt as well. #4: Take a seat at the MRT or the bus, as long as you have the chance. And take a jacket or something with you, it could get cold with the air conditioning. The same rule to be applied in every situation, where you are changing between outside and inside and vice versa. #5: Take a look at the people: I always regard the women with envy: there is no cellulite. You can scan as long as you want, most of the time you won’t find anything to complain about. Unless you are a foot fetishist like me. 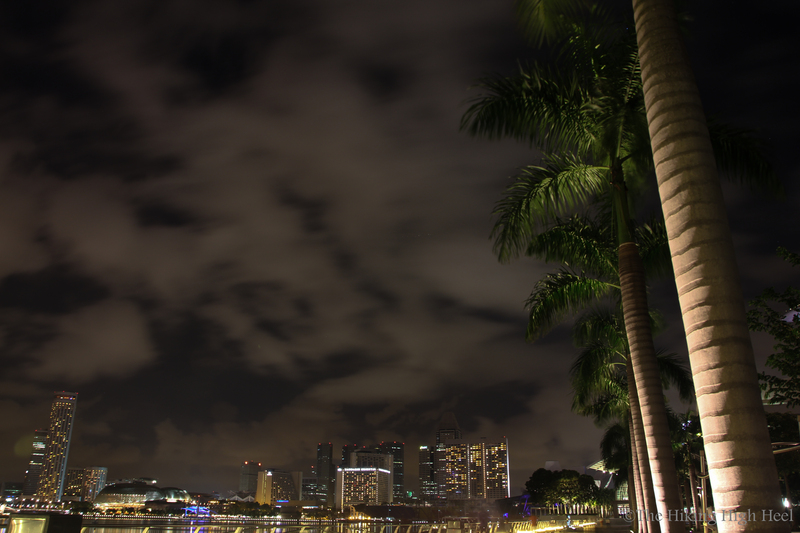 In Singapore, nearly everybody wears slippers or summer shoes, so you can see their feet. In the MRT I cannot stop staring at people’s feet. And sometimes, as long as you have to wait for cellulite, you have to wait for some nice feet to come around. Sometimes I think: What a waste of nice legs, if you are cursed with such feet… Ok, ok, ok, I’m just still envious! A girl has also a personality, not just feet. Because of my feet, I know, what I’m talking about :D. And when I’m honest, I’m always stunned, how good-looking most of them are. #6: The weather is the best thing ever!! Never colder than 27 degrees! Whatever time you go out, it’s always warm or very hot. And I’m one of those people, who like it hot. There is something very calming about the fact to be sure that you’ll never encounter any cold moments, whatever the weather is going to be. But most of the time, you will sweat as much as if there were no tomorrow. So remember my first hint with the beer. 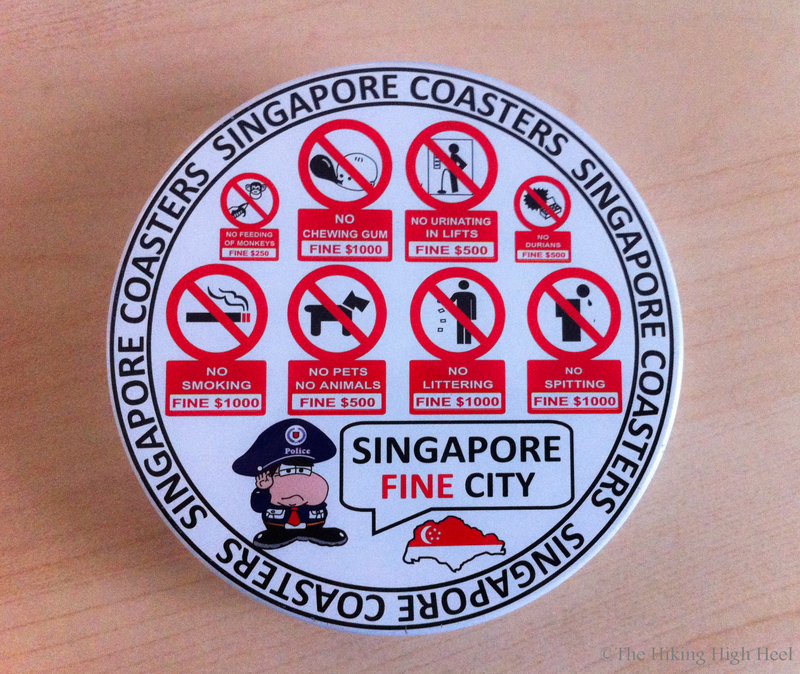 #7: The story with the chewing gum is true: you cannot buy any and you are not allowed to bring some to Singapore. Once I forgot and didn’t get caught. After that I „exported“ it unknowingly to Kuala Lumpur and tried to smuggle it back into Singapore, unknowingly again. This time I got caught. The fine is 1000$. But I managed to get some mercy and didn’t have to pay anything. I think, they don’t take it so seriously, but you better not find out, if they do. #8: It’s also forbidden to pee in an elevator or to spit on the street. It may sound obvious to some of you not to do these things, but during my stay in Shanghai later on, I discovered that this is really an useful rule. 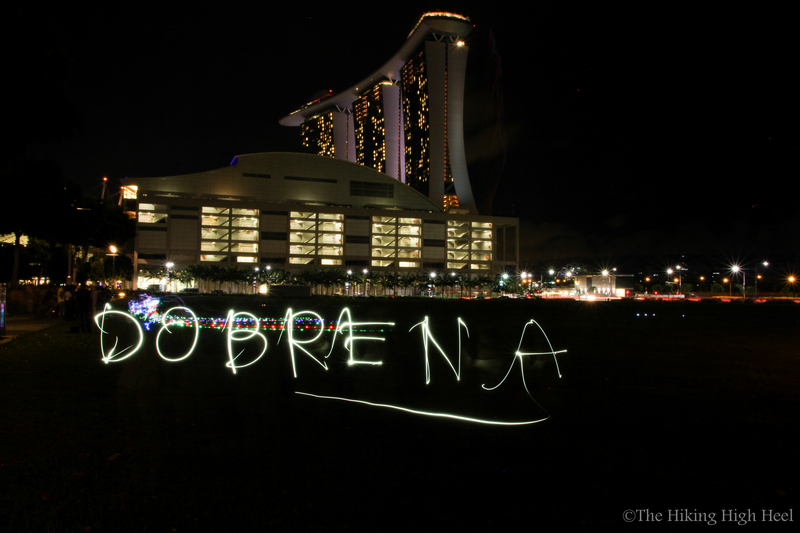 #9: Singaporeans love food. 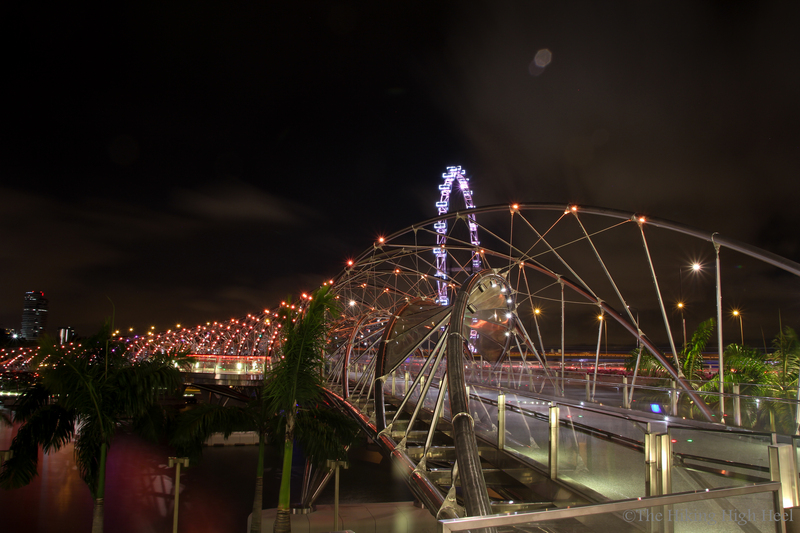 So if you love food too, then you can fall even more in love with Singapore. Unfortunately, there are so many new kinds of food that you can easily get overstrained. Sometimes I’m a very hoggish person, but quite picky. I must admit, I cannot eat slimy food, so I couldn’t really cope with the strange soups prepared with some indefinable ingredients. I gave it a try, but instead of soup it turned out to be a slimy dessert. Nevertheless, I recommend a visit to some food corner or a hawker center. A hawker center is a place with many different stalls, where you can buy food and sit down and eat it, wherever you find a free table. It’s something like an Asian fast food plaza. In Singapore I often went to the East Coast Hawker Center, which is the only seaside hawker center in Singapore. 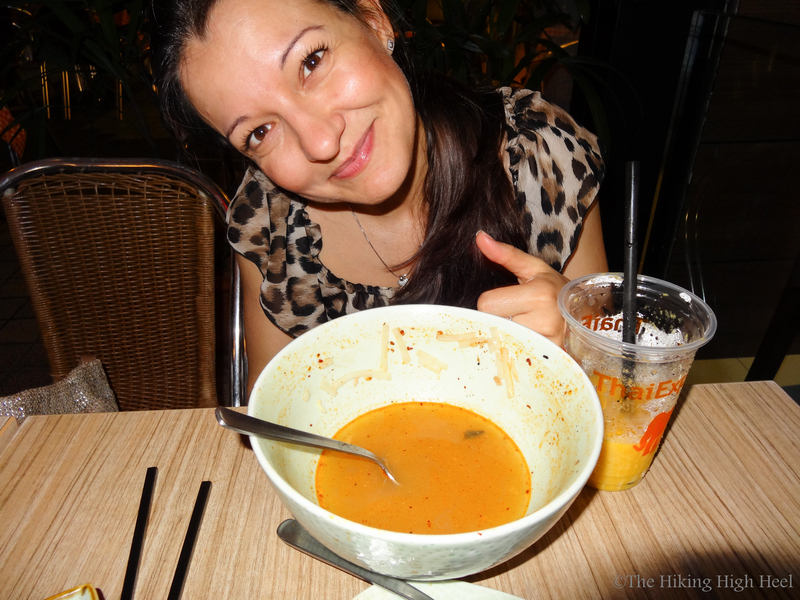 But my favorite is still the food chain Thai Express, where I ate my first laksa. I also like the mango chili salad with peanuts. 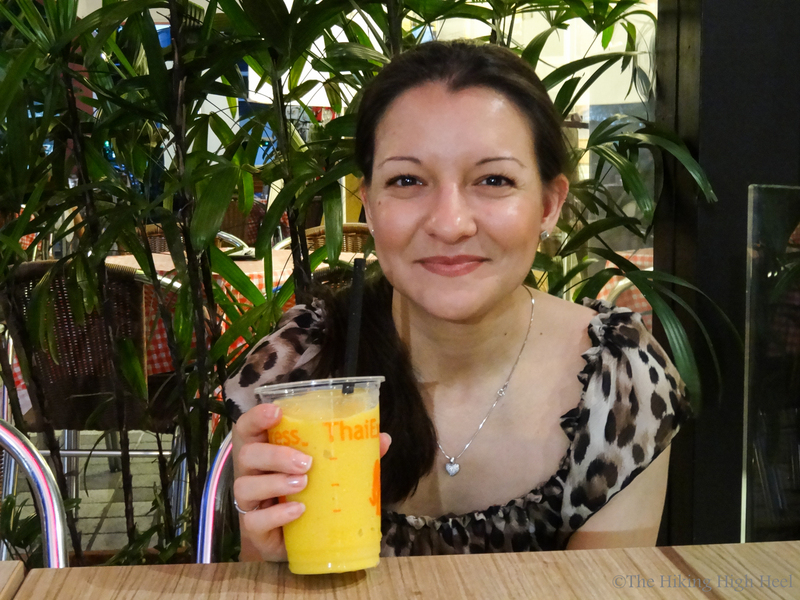 Don’t forget to order a mango lassi to accompany the food because it can be veeeeery spicy. The food at Thai Express is marked with a number of chilis to indicate how hot it is. 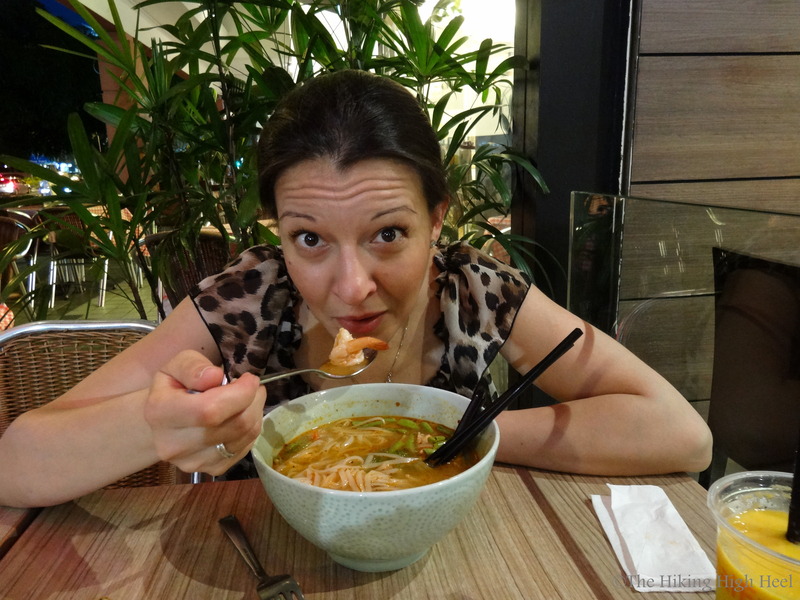 The laksa has about 3 degrees. I first wanted to order a ginger chicken with 6 chilis, because it looked very harmless. But I told myself not to push too hard. Which was a very smart decision. 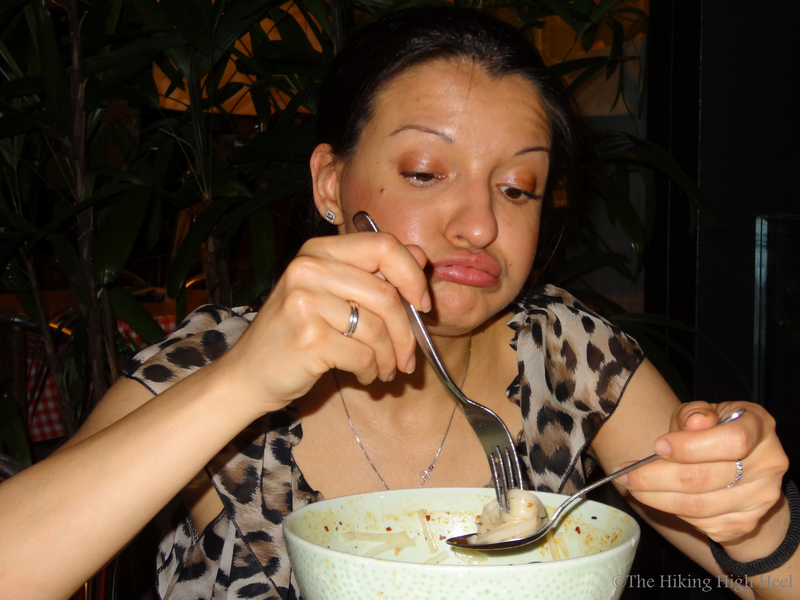 While eating the laksa, my state was changing constantly between snot and tears. I also needed about 28 tissues. The waitress was very empathetic with me bringing me more tissues every 3 minutes. At the end my lips were swollen, so I could have won a rubber boat contest. Day after day I got used to the hot and spicy taste, so later I could deal it with just about 5 or 6 tissues. Practice makes perfect. #10: Whatever you take: taxi or bus, you will notice that most of the drivers have a very digital driving style: they seem to know only two states: accelerating or stopping. They use the brakes also this way: there is no slowing-down just before the traffic lights or the bus stop. So don’t forget to firmly hold the pole, if you couldn’t manage to follow recommendation #6. 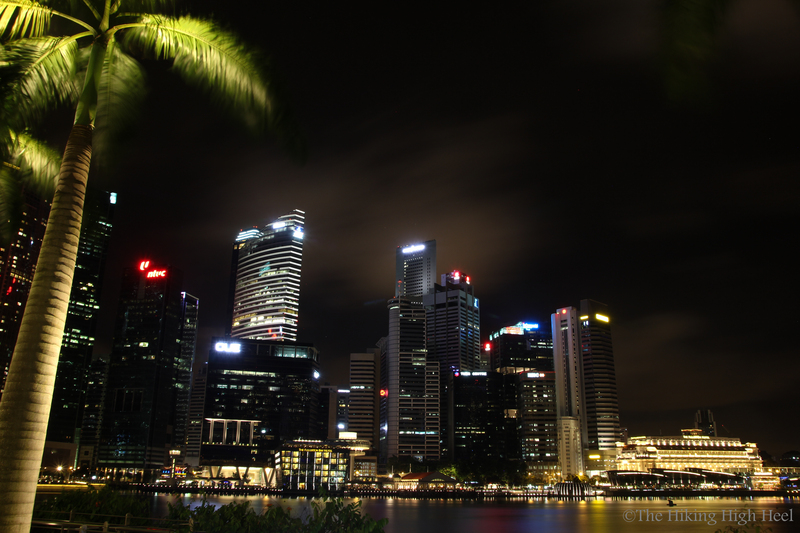 Have a nice week and stay tuned for more information about my favorite city Singapore!